Panther Moon is a 5 reel, 15 payline video slot from Playtech – it can be played from 15p to £15 a spin on desktop, mobile and tablet devices. Based on panthers at night time, this dark and simple game comes with a high value wild symbol that can double payouts and give you up to 10,000 times your stake. There’s also a Free Games feature where you can get unlimited free spins with a 6x multiplier. Visually, Panther Moon is quite simple as it was released a few years ago – set in a jungle at night time, symbols on the reels include A, K, Q, J and 10 royals as well as butterflies, flowers, wolves and owls. The latter 2 are the most rewarding giving you 50 times your bet for 5 on a payline. The black panther is the wild symbol are replaces all symbols bar the scatter – when it’s part of a winning combination, it doubles your payout. For example, if you were to get 4 owls on a payline with a wild, you’d benefit from a 100 times bet payout. Furthermore, 5 wilds on a payline will give you 666.66 times your total bet! 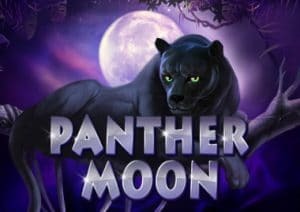 Panther Moon comes with a Free Games feature which is played when you get 3 or more full moon scatters – 3, 4 or5 will reward you with 5, 20 or 500 times your bet as well as 15 free spins with a 3x multiplier. Look out for scatters as 3 or more will give you 15 more free spins – there are no limits to how many additional free spins can be won. Now, if you get a win during a free spin involving a wild, it will be doubled – in theory, this will give you a 6x multiplier on wins with a wild in it. This can result in payouts 4,500 times your bet if you get lots of owls or wolves with a wild. Now, if you were to get a screen full of wilds, you’d benefit from a 10,000 times bet payout – with the 3x multiplier, that’s a massive 30,000 times your total bet! As you’d expect from the numbers quoted above, Panther Moon is a highly volatile video slot – it’s simple yes but 1 free spins with plenty of wilds could result in a huge pay day. If you like panthers, IGT’s Prowling Panther is recommended as to is Microgaming’s Exotic Cats.